As the sun sets, live music plays throughout a beautiful garden in Pomona. Guests sit at the decorative tables, drinking their wine and enjoying the warm weather that contrasts with the dark skies. Even though the tables are filled with people, the experience is still cozy and intimate. The wind blows as the guests are first greeted with drinks and hors d’oeuvres. After, McKinley’s Grille Executive Chef Vincent Cavalli prepares a five-course meal dinner using the sustainable ingredients handpicked from the five-acre organic farm, which is the setting for the exquisite dinner. McKinley’s Grille and the Fairplex partnered with one another to create the Farm at the Fairplex Dinner Series. At the dinners, guests have the opportunity to watch their food being prepared, using the ingredients from the farm that surrounds them. The dining experience offers an evening of mouthwatering food and drinks, prepared at the Farm at Fairplex. The Los Angeles area is known for its sunny weather and heavy traffic, but not for its farming lifestyle. The Farm at the Fairplex provides not only produce for the dinner series, but they offer the farm-to-table experience through the Sheraton Hotel and McKinley’s Grille. Year round, staff and volunteers work at the Farm at the Fairplex preparing produce, including fruits and vegetables. The workers spend their time watering the plants, gardening and growing them. The produce requires a lot of attention, and after it has grown to its full potential, a staff member drives the produce over to the Sheraton Hotel. The McKinley’s Grille chefs cook and serve the produce at functions that are held at the hotel’s conference centers. The farm provides activities, educational series and delicious cuisine in the Pomona community. Many Los Angeles County Fair attendees visit the red rustic farm sitting at the opposite side of the fair. The outer appearance of the farm is wooden and reminiscent to a barn from an old Western film — quaint and spacious, and if visitors travel further, they can view the 5-acre organic garden. “I believe that localism is very important, especially when it comes to buying items. Buying produce from a local farm boosts the local economy, and it also ensures you that you are getting a fresh product that didn’t travel 500 miles on a truck to get to the grocery store,” Cassidy says. She also believes that localism benefits the community by boosting the local economy, ensuring that citizens purchase fresh items and promoting a more sustainable lifestyle. 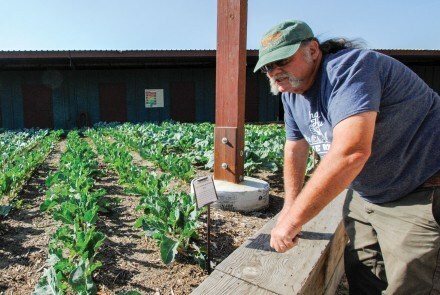 The Huerta Del Valle Community Garden, located in Ontario, is another community garden. Executive director Maria Alonso, members of the Ontario community, Pitzer College, the city of Ontario Planning Department and the Healthy Ontario HEAL Zone initiative started the garden in response to health needs in the community. The organization came from the need to provide healthy, affordable organic food to families dealing with diabetes, obesity, ADHD and other health issues. The goal of the organization is to see one garden every mile in every city so that all people have access to safe, affordable, delicious and nutritious food. The community garden is open to the public through tours, educational workshops, celebrations, potlucks and farm-to-fork dinners. Families and groups as big as 60 frequently visit the garden to volunteer. Arthur Levine, project manager, thinks it is wonderful how localism is spreading across California. “It is a way to keep local dollars in the local economy so that people in our communities can prosper and grow. I think it has potential to reduce fossil fuel emissions and create healthier, more livable communities. Ontario is the antithesis of localism since a lot of its economy depends on a global trade system,” Arthur says. He hopes to see more restaurants using local food and to see members of the Ontario community supporting the redevelopment of places such as Downtown Ontario with locally-owned businesses that use locally-produced goods. Localism refers to people knowing where their food comes from. A person cannot determine if the produce found in huge grocery store chains is healthy based off of what the wrapper says. Purchasing food from local farmers markets can prevent a lot of health risks that are constantly discovered in food at supermarkets. For example, GMOs (genetically modified organisms) are products that have been enhanced or artificially tampered with through genetic engineering. Recent evidence suggests that some health problems may be related to the consumption of GMOs. According to the Non-GMO Project, “the U.S. government has approved GMOs based on studies conducted by the same corporations that created them and profit from their sale.” In U.S. supermarkets, GMOs are in 80 percent of processed food. Because the lack of knowledge for GMOs, many people have chosen to depend on local products instead. Localism Inc. is a private company in Long Beach that spreads awareness of localism. Its mission is to create a connected community through influencing people to choose locally owned merchants, local growers and other local organizations. “We campaign local businesses made in Long Beach,” David William Ferrell, chief executive officer, says. Localism Inc. connects the local marketplace to the people of Long Beach who are interested in supporting local vendors. Localism Inc. overall supports the localism movement because it keeps the economy flowing in their community. Studies found that there is a positive shift in the economy if communities focus on local businesses as opposed to global corporate supermarkets. Supporting and buying from local businesses makes a huge profit that recirculates in the economy. Only a small profit of the money people pay for produce goes towards the grower and the rest goes towards the middleman, who transports the item and to the market chain. Buying locally takes the middleman and chain out of the equation and supports local farmers. “By making conscious decisions to support local merchants, food growers and service providers, we are embracing our local economies and empowering our cities, our neighbors and ourselves to grow and thrive,” David says. The farm was originally a part of the fairgrounds that were developed in the early 1920s by a group of businessmen. The businessmen decided to put on a spring harvest in the local area. The harvest was so successful that plans for a county fair began to emerge. The city of Los Angeles denied the business plan, leaving the men to create the fair themselves. The men purchased around 100 acres of land in Pomona and put on the first Los Angeles County Fair. The city saw the success of the fair, finally took interest and developed it into the Fairplex. A small garden was placed in the farm around the 1950s and was the first component to adding farm life to the Fairplex. With the rise of the Fairplex came more vendors, companies and the Sheraton Hotel. Eighteen years ago, chefs were hired into the new restaurant at the Sheraton Hotel, and they had an interest in finding ways to get local ingredients for the food. Chef David Tieg, the new executive chef at the time, wanted to give the fair attendees something at the restaurant that was different than what they were eating at home. He talked with Don DeLano, the Fairplex horticulturalist, about finding ways to promote locally grown food. Don came up with the idea of expanding the farm for additional produce. “David and I had talked about developing the garden and the many ways we can expand it from hotel dinners to the learning centers,” Don says. In 2007, Don and David received a $400,000 grant from the city of Pomona to help build the farm in the direction they wanted. In 2014, a day before the fair opened, the farm was finished and ready to open the next day. Today, the farm is still in a partnership with executive chef Vincent Cavalli. “We are still applying for grants to build a greenhouse and make a more efficient year-round garden because of the time restraints. The farm is growing more and more because we collaborate with different companies and projects,” Don says. The first project they started with the farm was to create dinners for the hotels using the farm’s produce. The second project was connecting local farming to a learning center. The farm partnered with the Learning Centers to teach the community to harvest crops, sell their own plants and learn how the farming industry works. “We use the farm as a learning lab to teach students about healthy eating, California agriculture and locally growing their own food,” Margie Shamblin, the manager of education at the Learning Centers, says. The Learning Centers encourages children, students and adults to volunteer at the farm to learn where their food comes from. The farm’s program compliments all ages and teaches everyone about the agricultural lifestyle. Don gives daily tours of the farm and gives guests hands-on experience of plant life. He even encourages his guests to have a taste of some of the produce right from the garden. The farm is constantly looking for volunteers to lead student groups on a tour of the farm. “The volunteer program is enjoyable and many students consistently come back to help because they have such a great time. We try our best to encourage the whole family to visit the farm, because the farm is the perfect place for kids and adults to come together as a community,” Margie says. The farm also offers agriculture-related education programs such as urban farming classes held at the farm. High school students are able to earn credits by taking this course. The current project Don is working on is finding ways for the farm to connect with the community. Farms are a rare sighting in the Pomona area, so Don is encouraging the community to come out to the farm’s events. Monthly events such as Grow Pomona and the Farm at the Fairplex Family Volunteer Day promote agriculture. Both are used to help the community consider that everything they eat, wear and use comes from American agriculture. The farm can also be rented for weddings, corporate events and more. 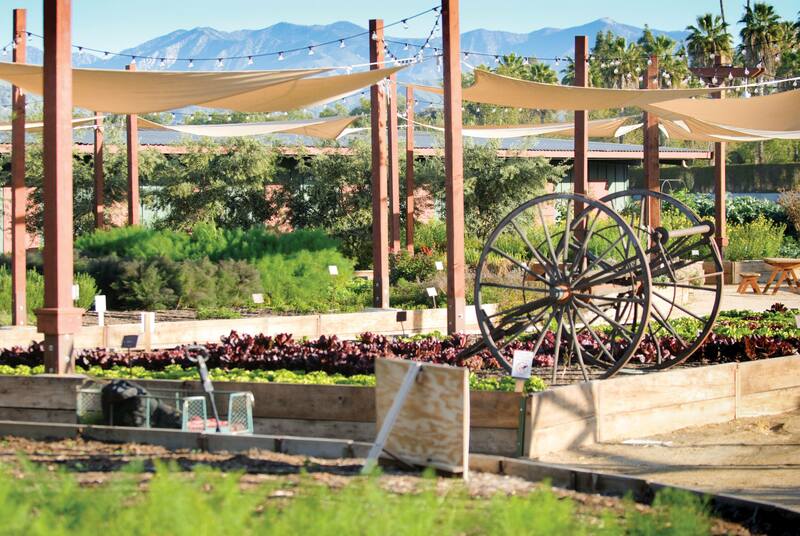 To those at The Farm at Fairplex and others trying to create more local food options in Southern California, localism is important to keep communities thriving and healthy. Families gain a more sustainable and healthier diet. Localism keeps the economy moving by bringing the community together to support small local businesses. Creating local farms and gardens provides healthy food options and agricultural education. The Farm and McKinley’s Grille at Fairplex are local places where the food is also local and keeps agricultural education alive.